A team of contributors shares their picks for underappreciated pharmas that deserve more attention. Over the past year, the best-performing drugmaker stocks all have had one thing in common: They received very little attention before providing patient investors windfall gains. Being considered insignificant in itself isn't a great reason to scoop up shares of Teligent (NASDAQ:TLGT), Synergy Pharmaceuticals (NASDAQ:SGYP), or Portola Pharmaceuticals (NASDAQ:PTLA), but these three Motley Fool contributors wanted to share some reasons these underappreciated companies belong on your radar. Brian Feroldi (Teligent): Being called a "specialty generic" drug manufacturer might sound oxymoronic, but Teligent has stumbled on a clever business strategy that could make it a great stock to put on your watch list. Unlike most generic-drug manufacturers, Teligent focuses exclusively on selling products from the topical, injectable, complex, and ophthalmic markets. The company's products include a number of lotions, creams, and ointments. Each year a number of brand-name drugs from these categories lose patent protection, allowing Teligent to swoop in, make a generic, and send it off for regulatory approval. Once it gets the green light from regulators, it sells its product at a discount, allowing it to steal market share. The company has been running this simple playbook for a number of years with great success. 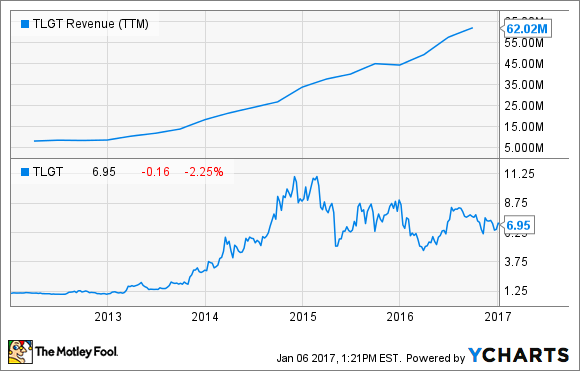 Here's what happened to this company's revenue and stock price over the past five years. The company's revenue has been on a tear, and it shows no sign of slowing down. Last year, Teligent won FDA approval for nine new products. That's a big number when compared with the 11 products it had in its entire portfolio at the end of 2015. As those products hit pharmacy shelves, Teligent's top line should continue to surge. That makes this drugmaker a great stock for growth-focused investors to get to know. Keith Speights (Synergy Pharmaceuticals): Synergy Pharmaceuticals is on a roll. The stock is up nearly 65% in the past six months. Synergy's experimental gastrointestinal drug, plecanatide, is behind the tremendous momentum. In December, Synergy announced results from two late-stage clinical studies for plecanatide. Both studies evaluated the drug in treating irritable bowel syndrome with constipation (IBS-C). Synergy expects to submit for regulatory approval in the first quarter of 2017. The U.S. Food and Drug Administration is currently reviewing Synergy's new drug application for plecanatide in treating chronic idiopathic constipation (CIC). The agency is expected to make its decision by Jan. 29. While anything can happen with the regulatory process, I think Synergy's chances of approval look pretty good. If approved, plecanatide should have a sizable market -- around 14% of people in North America suffer from CIC. Around 4% to 5% of American adults have IBS-C.
Cory Renauer (Portola Pharmaceuticals): Portola Pharmaceuticals stock recently rocketed up after the FDA agreed to an expedited review of an application for what could become its first commercial-stage drug. Betrixaban is an oral factor Xa inhibitor of the sort that is quickly replacing age-old warfarin as the blood thinner of choice. Last year, betrixaban produced some mixed data in a head-to-head study with an older, injectable drug of the same class, but it still has a solid shot at earning approval to prevent dangerous blood clots in patients who have been hospitalized for serious medical conditions. While an approval for betrixaban this year would send Portola Pharmaceuticals stock climbing, a different drug candidate could be another serious value-driver. In biopharma circles, Portola's main claim to fame is an antidote to drugs such as betrixaban and Eliquis from partners Bristol-Myers Squibb and Pfizer. Factor Xa inhibitors can cause uncontrolled bleeding events, and Portola's AndexXa could become the first fast-acting agent available to reverse its effects. Last year, the FDA asked Portola for more information regarding AndexXa's use in a less common factor Xa inhibitor, and to clear up some manufacturing facility concerns. The setback was disappointing, but its chances of approval the second time around seem solid. In fact, Bristol-Myers and Pfizer feel good enough about its prospects that they offered Portola a $50 million unsecured loan to further its development. With two drugs approaching the finish line, this is one little pharmaceutical company you should be hearing a lot more about.